Yu. Litvinov (left) and J. Glorius (right). Results from our latest experiment in the ESR investigating the proton-capture reaction on 124Xe for explosive nucleosynthesis have recently been published in Physical Review Letters. This pilot experiment has been conducted in 2016 and its success represents a milestone in the developement of low-energy nuclear reaction studies in storage rings. It is the first of its kind realized inside the astrophysical Gamow window and as such it paves the way to future low-energy studies in the ESR and in the new CRYRING facility at GSI. The TDR of the Schottky system within the ILIMA collaboration has been accepted by the ECE committee on 14.12.2018. This is a great milestone in the development of non-destructive Schottky detectors for experiments in the future FAIR project. A link to the TDR is available online here. On Monday October 15. 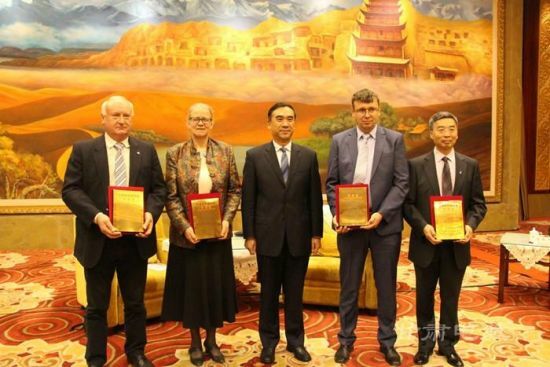 2018, the prestigious Dunhuang Prize was awarded by Li Bin, the vice Governor of province of Gansu to Prof. Yuri Litvinov and 6 other laureates. This prize is the highest honor awarded by Gansu Provincial People's Government to foreign experts in areas of science, technology, education, health, economy and management, who have made distinct contributions to the development of Gansu province. It is named after the city of Dunhuang in the northwestern region of the province of Gansu, a historic city on the ancient Silk Road. Since its first edition in 1996, 177 experts have received such a prize. Prof. Yuri Litvinov is the second GSI scientist receiving this award. In 2004, Otto Klepper was awarded for his contributions in establishing a fruitful collaboration between the GSI and the IMP research divisions. More information can be found on the web site of Institute of Modern Physics and also here in news. On Wednesday September 26, 2018 our PhD student defended his thesis at Justus-Liebig-Universität Gießen. The title of his thesis is "Aufbau einer Datenaufnahme zur Integration von Schottky-Signalen in Atomphysikexperimenten an Speicherringen" and can be found here. 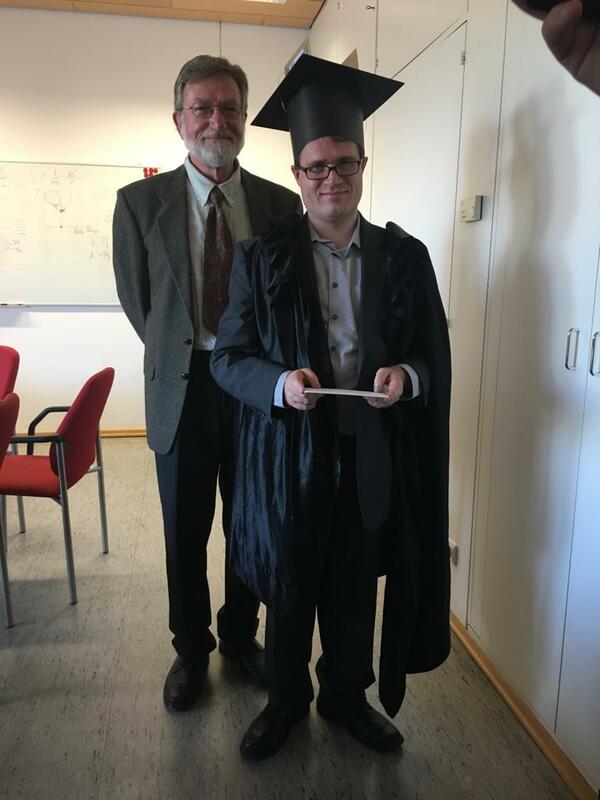 Congratulations to Dr. Christian Trageser! We wish him all the best for his future. 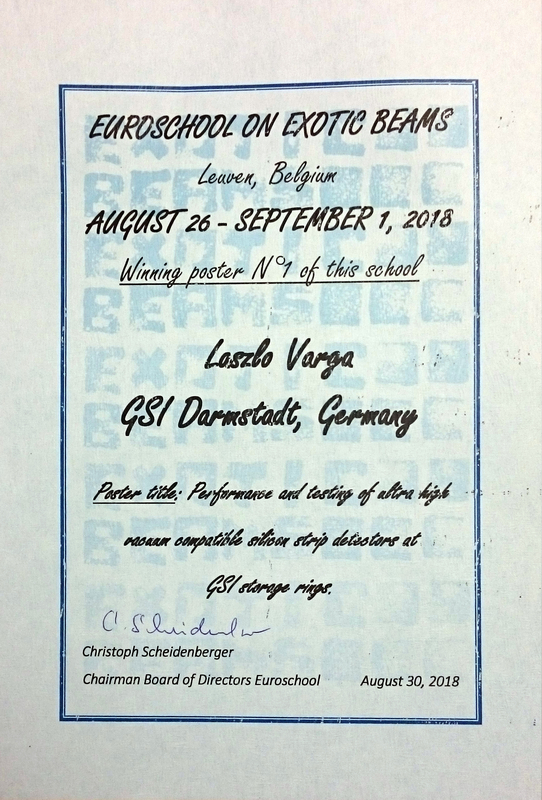 Laszlo Varga, our PhD student in ASTRUm has once again received the best poster award of the Euroschool on Exotic Beams 2018 held in Leuven from August 26 to Sep 1, 2018. The poster has the title: Performance and testing of ultra high vacuum compatible silicon strip detectors at GSI storage rings. Last week of January and beginning February 2018, ASTRUm group was again hosing high school students from the schools in cities around. In this short term internships, high school students got to know different aspects of the practical work of detector development, Python programming and signals. Laszlo Varga was awarded for the best poster presentation at the 10th International Conference on Nuclear Physics at Storage Rings (STORI'17) which took place in Kanazawa/Japan from November 13th to 18th, 2017. Congratulations, Laszlo! A newly designed resonant Schottky Cavity pik-up was delivered after several months of mechanical construction. The subsequent vacuum tests in GSI's UHV lab were also successful so that the device is now ready for the detailed RF tests in the lab. This particular Schottky detector is of the cavity type which shows high sensitivity around its eigenfrequency and is suitable for use with lower number of particles in the storage ring. After successful RF tests and further UHV cleaning, it is planned to test this cavity in the experiment storage ring ESR at GSI. Named after a renowned GSI physicist and former member of the group, the newly established lab is now ready for design, construction and test of non-destructive detectors for ion beams in storage rings. The lab space, which consists of a double container has been renovated since January 2017. Walls, air-conditioning and heating system have been replaced. Meanwhile all equipment, cabling and networking is ready for a good start. Experiment E127 "Measurements of proton-induced reaction rates on radioactive isotopes for the astrophysical p process" was evaluated by the General Program Advisory Committee (see this link for more details). Experiment E121 "Measurement of the bound-state beta decay of bare 205Tl ions" was evaluated by the General Program Advisory Committee (see this link for more details). 21 shifts from 21 shifts requested were granted. Dr. Sergey Torilov, Associate Professor at the department of physics, St.Petersburg State University, has been awarded with the prestigious "Dmitrij Mendeleev" Scholarship 2017 for working in Atomic Physics division at GSI, Darmstadt. Torilov received the M.Sc degree in nuclear physics from the St.Petersburg State University in 2000. He continued his study as a PhD student in Hahn-Meitner Institut in Berlin under the supervision of Prof. W. von Oertzen. In 2008-2011 he headed the international research group at the University of Jyvaskyla, Finland. Torilov took part in many international projects (Germany, CERN, USA, Finland, Poland) and he is co-author of more than 50 articles. His current research interests include astrophysics, cluster degree of freedom in nuclear structure and reactions with heavy ions. Within the awarded scholarship, supported in Germany through DAAD, Prof. Torilov will work in the Atomic Physics division and ASTRUm group on future experiments in the ESR and CRYRING in the field which is known as “The border between Atomic and Nuclear Physics”. Prof. Dr. Yuhu Zhang, the director of The Key Laboratory of High Precision Nuclear Spectroscopy and Center for Nuclear Matter Science, Institute of Modern Physics, Chinese Academy of Sciences, Lanzhou, People’s Republic of China, has been awarded with EMMI Guest Professorship and visited Atomic Physics division, SPARC Detectors group, and the ASTRUm group from 18.7 to 17.9.2017. He was awarded now with the prestigious WU You-xun (WOO Yui-hsun) Prize (for Nuclear Physics) of the Chinese Physics Society. Prof. Yuhu Zhang in the award ceremony (middle). GSI and FAIR researcher Dr. Yuri Litvinov was awarded with an adjunct (German: außerplanmäßige or APL) professorship at the Ruprecht-Karls-University in Heidelberg. Already in 2011 Litvinov had completed his habilitation and was teaching atomic- and – since the last year – also accelerator physics as a so-called Privatdozent. His achievements in teaching and research were honoured by the nomination for an APL professorship. This took place in January 2017, and the evaluation process was now completed: The faculty and the senate of the university approved the appointment. The certificate of the adjunct professorship has been handed to Dr. Litvinov by the vice-president of the University of Heidelberg, Professor Beatrix Busse, on 29 August 2017. Litvinov studied physics in St. Petersburg and is a GSI researcher since 1999. In 2003 he defended with distinction his PhD thesis at the university of Gießen (doctoral supervisor Professor Hans Geissel). Starting in 2009 he spent two years at the Max Planck Institute for Nuclear Physics in Heidelberg for his habilitation. Since then Litvinov is actively involved in the APPA/SPARC research activities led by Professor Thomas Stöhlker. Among other tasks at GSI he is the coordinator of the experiments at the experimental storage ring ESR, and since 2012 he is the head of the SPARC Detectors department, which has now moved to the Atomic Physics division. Since 2016, Litvinov is the principal investigator of the ERC Consolidator Grant „ASTRUm“ funded by the EU. This years's summer school students arrive from 2 different universities (St. Petersburg and IMP-CAS in Lanzhou) arrive. They will spend the summer time attending lectures and also work on practical topics in the lab. Good luck! ASTRUm welcomes 4 new PhD students to the group. These new PhD students will work on different topics ranging from experiments to detector developements. Good luck!